Mother asked me to dig up this recipe (apparently from 2009!) which I made for a World Geography school project. I had chosen to make something from Spain because I wasn't familiar with Spanish cuisine. 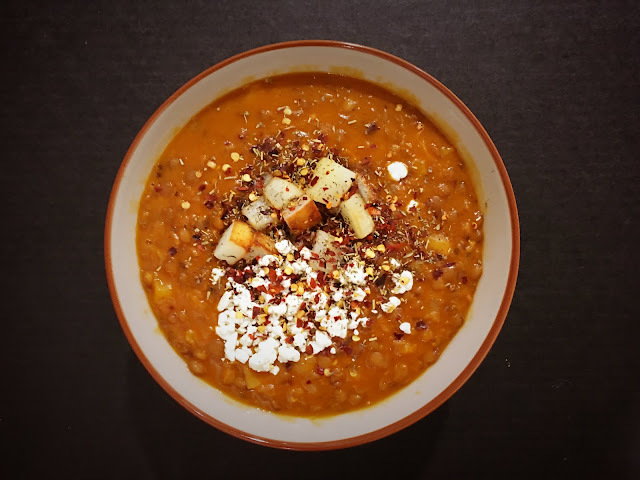 I had come across a lentil soup, which I figured I'd like, since I love dal. The following recipe, which serves 12 as a side dish, is simple to make. The soup, which we paired with pita bread, has a lovely dal-like consistency and a Spanish flavour that is both hearty and satisfying. It can be enjoyed as a whole meal, after which you might wish to have a siesta. 2. Then add the green pepper, and pimento. 4. Add in the carrots, lentils, tomatoes, water and salt. 5. Cover, and bring up to pressure over medium heat. 6. Lower the heat (the soup will burn otherwise) and continue to cook for about 20 minutes. Serve with a crusty baguette, rice, or pita bread. Here, we served it with our baked potato bites and a sprinkling of feta. *If you don't have a pressure cooker, you can use a large pot, but you will have to simmer the soup for about 2 hours.